Welcome back to another Outdoor Extravaganza week! Let’s do a quick recap of the projects for this series. Week 1: Last week we shared our DIY gardening projects where I shared my secret on what to fill in large outdoor planters. 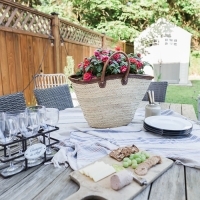 Week 2: For this week, it’s all about Outdoor Decorating and Entertaining. 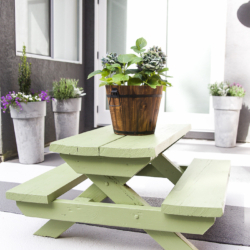 Week 3: is all about Paint & Build-It Projects – Kids’ Picnic Table Makeover – Fix the Rot or Just Paint It? I recently purchased a new outdoor table and chairs so it was my first time styling it. The rained finally stopped this week so we could enjoy a meal al fresco style. 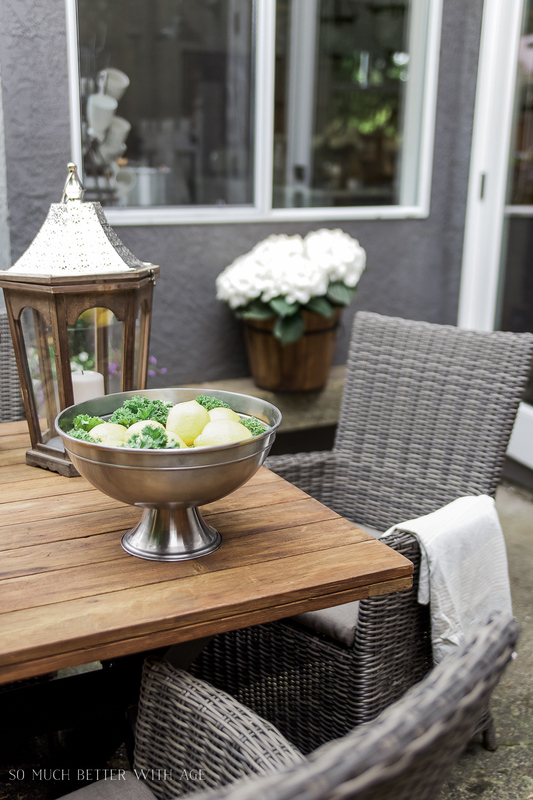 I love a casual but beautifully styled table and this is no different for an outdoor table. 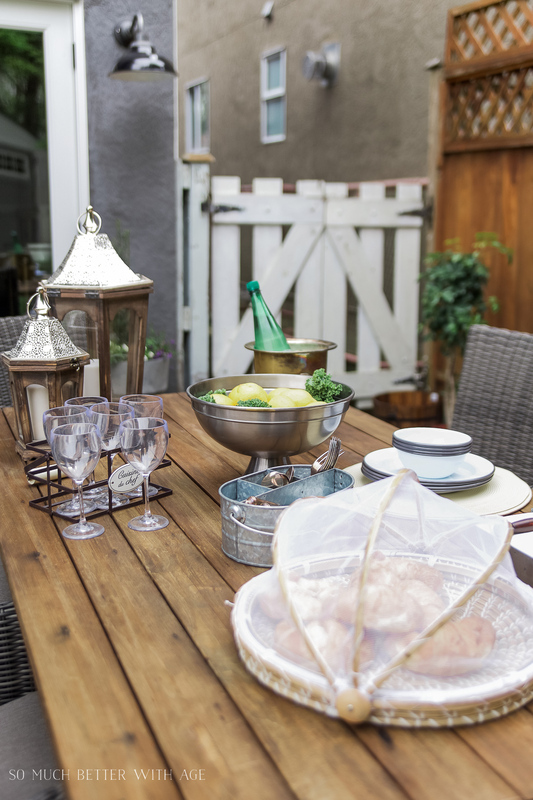 Let me show you how to set a casual outdoor table, French Vintage style. 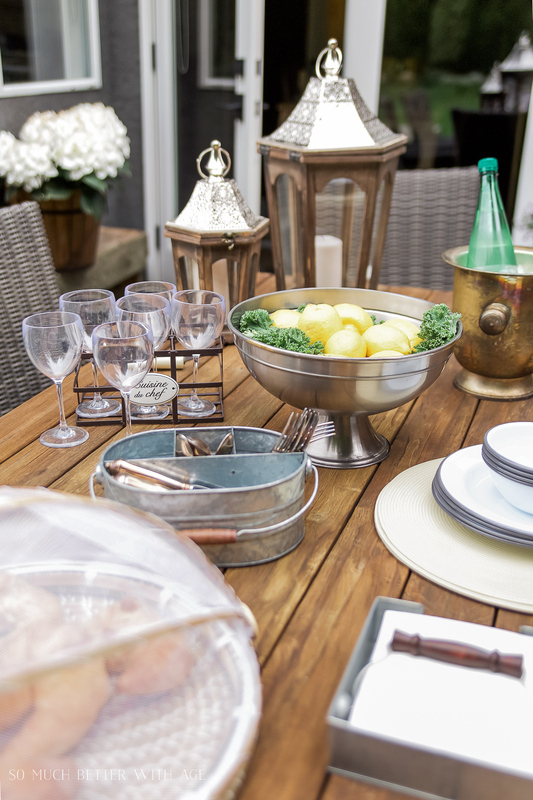 I love to place all the items on an outdoor table very casually, family style. There’s no need for fancy items but I do like to bring out some items that have height and different textures like metals. Items like this vintage champagne bucket and silver bucket are easy to clean after use and won’t break if accidentally dropped. 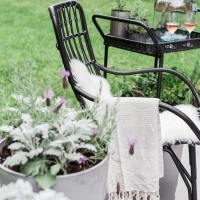 Acrylic wine glasses are a must for outdoors. This set was given to me years ago and they come in the perfect little carrying metal basket. I love enamelware and found these white and grey plates and bowls from West Elm a couple of years ago. You can also find enamelware at camping supply stores. 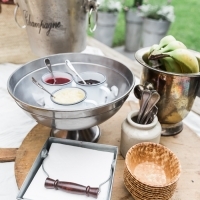 Be sure to have napkins handy and in a container like this galvanized tray with holder so they don’t fly away. This one I found at Home Sense. With plenty of flowers and greenery already outside, I love having a centrepiece that doesn’t include flowers but is natural. Fruit and vegetables are the best choices! Here is my kale and lemon centrepiece. The ideas are endless on what items you can use from the refrigerator. Plastic cutlery is fine to use for the outdoors but I prefer my regular flatware. 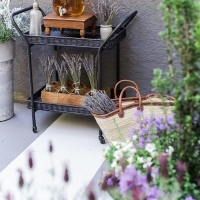 Pop the flatware into a container like this galvanized bucket or in some mason jars would look pretty too so guests can help themselves. A nice bottle of rose in the champagne bucket is the perfect touch but for this lunch we opted for Perrier instead, with lemon of course. The green bottle matched perfectly with the kale centrepiece. 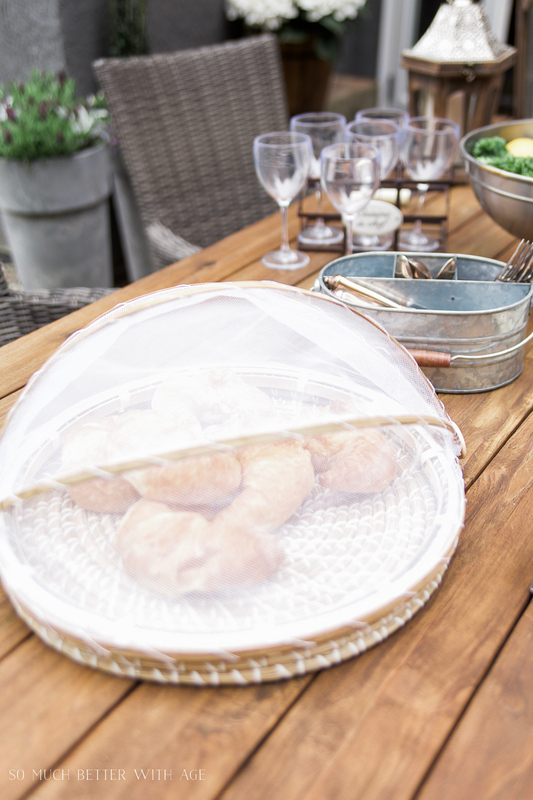 Baked goods and breads are easy to take outdoors but why not bring them out in a wicker tray with a net. I snagged this one up from Home Sense. I also found the exact same one at Pier 1. It’s nice to have some light blankets on hand. I love using Turkish towels for light blankets. Every item I love goes with my French Vintage style but you can find things around your house and thrift shops (like where I found my champagne bucket), camping stores (enamelware plates) and places like Home Sense, Home Goods and TJ Maxx to find good prices on beautiful things. The plants are planted, the outdoor table and chairs have been purchased, the table has been set, my boyfriend built me a new shed built for storage. I have a kids’ wooden picnic table to repaint for next week and I’d love to paint the concrete slab that makes up this patio. With the sun staying all this May long weekend, I’m hoping to tackle those projects. Let’s see if the weather holds out and what I get accomplished so I can share with you next week – our final week in this Outdoor Extravaganza. 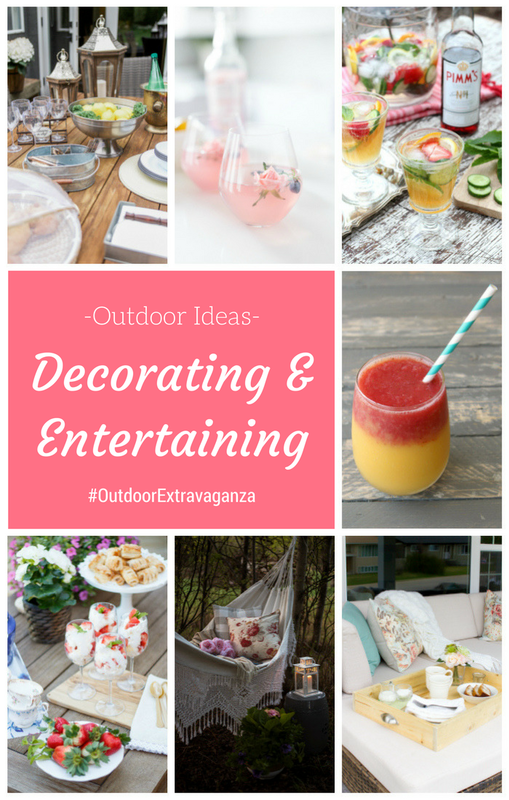 Now be sure to visit my blogger friends and see how they do outdoor entertaining. 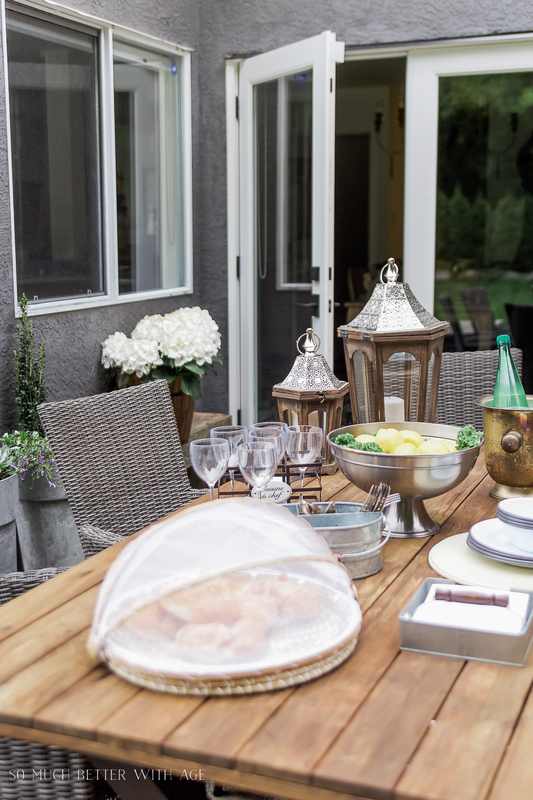 How to Set a Casual Outdoor Table, French Vintage Style by So Much Better with Age –> that’s me! 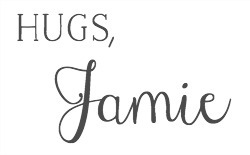 Gorgeous, Jamie! I have many of the same pieces and love playing around with different combinations. 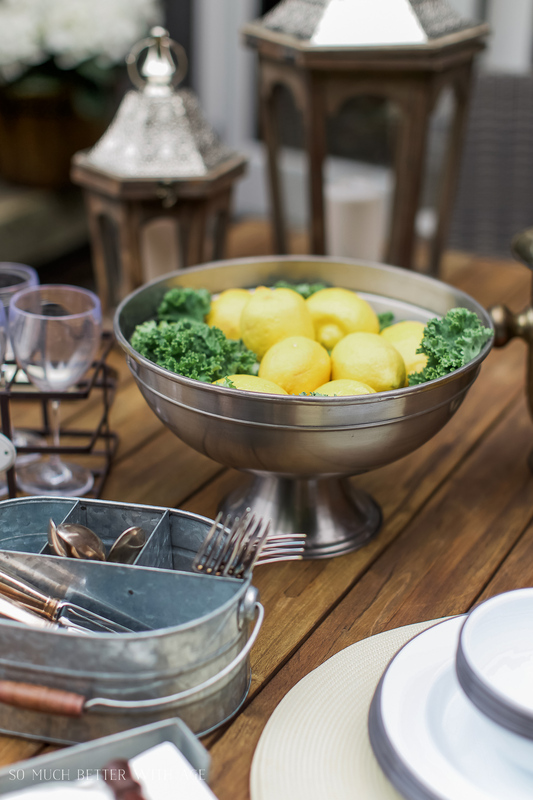 In fact, I’m working on an outdoor table setting today that I’ll be sharing next week. Enjoy your long weekend (hopefully outdoors)! Thanks Shauna! It’s fun decorating an outdoor table. Can’t wait to see yours. Have a great long weekend too! Everything is lovely. Summer is the time to enjoy being outdoors and without fuss. But, your table can still be pretty and yours is. Your table looks great ,such a great idea about where to purchase some enamelware . I know, right? The rain has been crazy the last week. Here’s to lots of sun this May long weekend! 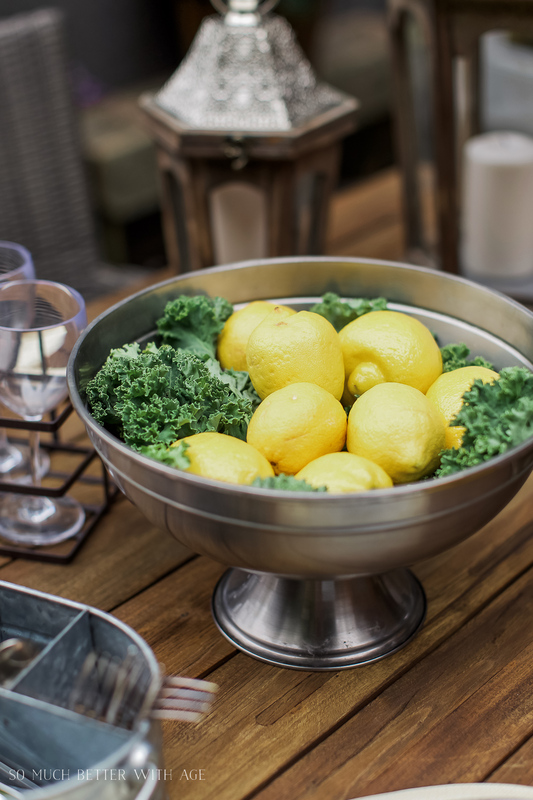 Where can I purchase the container holding the lemons and kale? Gotta have this! Your patio is lovely. The silver bowl I bought at Pottery Barn. I left a source above for a similar one, Antique Silver Sentiment Serve Bowl. The exact one of mine I cannot find on their website anymore. It’s very similar without the script writing along it. I have many pieces from their Antique Silver collection that I just love! That’s so kind of you, Janet! Thanks so much. What a gorgeous table setting! Using acrylic wine glasses is absolutely genius! Definitely going to invest in a set of those! Thanks for sharing your tips with us at Merry Monday this week! Thanks so much, Marie! Yes, acrylic wine glasses a must! 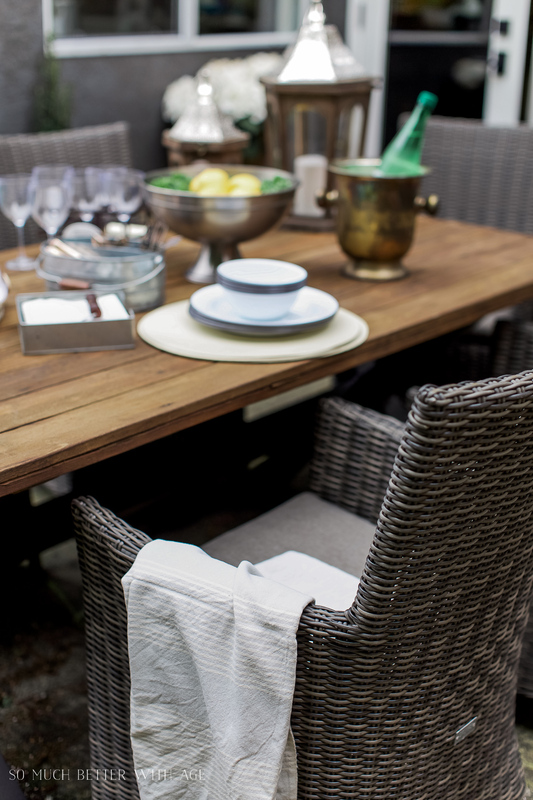 This is the perfect setting for dining al fresco. I imagine that your guests would want to linger for a long time. Thanks so much, Sandra! It’s very cozy…when it’s nice out! Looks good! You have some really fun ideas! 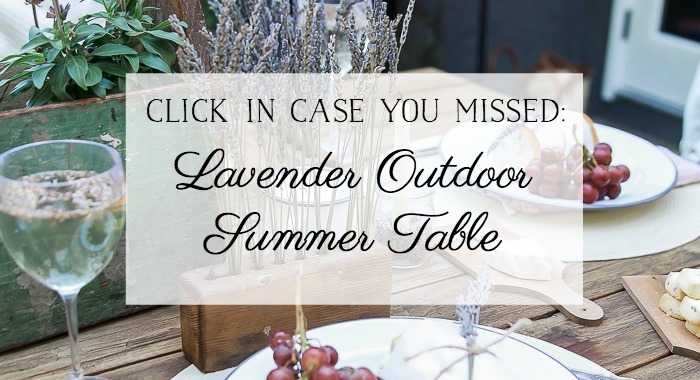 This is such an inviting summer table! The net covers for platters and trays are a must in my neck of the woods due to flies and gnats. I love your lanterns, too!